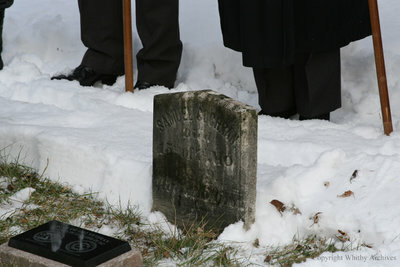 A colour photograph of the War of 1812 dedication plaque and Samuel Cochrane's gravestone in the Society of Friends' Cemetery, Ajax, Ontario. Samuel Cochrane War of 1812 Dedication Ceremony, December 2013, Megan Pugh. Whitby Archives D2014_002_001.